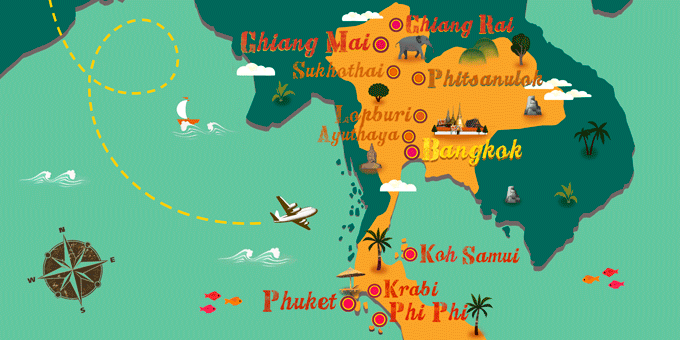 A vacation package to Thailand is one of the favorites for travelers to Southeast Asia. A true classic, that consistently appeals to travelers due to its fantastic mix of spectacular beaches, temples, delicious food, the range of activities and the friendliness of its people. The famous Thai smile is not just a cliché: it's a reality that you will understand as soon as you travel to Thailand, in other words, the ancient Kingdom of Siam. The capital, Bangkok, is a bustling metropolis, a cultural treasure that is worth spending the time to discover, before leaving for one of over a hundred tropical islands that spread throughout the Gulf of Thailand and the Andaman Sea, a staple of any package tour to Thailand. Whether you’re in search of the sounds of the best party, or just the whisper of the waves, you will find it here. If that wasn't enough, the most intrepid travelers can discover the north of the country and the mystery of the jungle in Thailand's Golden Triangle.